As Pope Francis takes over stewardship of the Catholic Church, he will also focus on the more worldly task of cleaning up the Vatican's finances. At one of the last meetings they held before electing the new pontiff, the church's cardinals were briefed on moves to reduce financial secrecy and address failings in controls that have drawn criticism from regulators and led to a temporary halt to card payments inside the Vatican this year. During his time as pontiff, Pope Emeritus Benedict introduced new laws, created a supervisory body and hired a top Swiss financial crime fighter in a bid to raise standards. But he fell short of his goal of having the Vatican included on a "white list" of states. "[Pope Francis] has only to look that it goes on, that these weak points are taken up seriously," Cardinal Christoph Schoenborn of Austria told CNN. "I'm convinced he will do, (as) he has done in his dioceses, he will do it in the Vatican, in a very decided but also human and Christian way." One of Benedict's last acts was to hire German industrialist Ernst von Freyberg as head of the Vatican bank, filling a vacancy created in May 2012 when Italian banker Gotti Tedeschi was removed by his fellow directors for incompetence. In response to a critical report by European anti-money laundering experts Moneyval last year, the Vatican appointed Swiss lawyer Rene Bruelhart to head the newly created Financial Information Authority and lead its push for greater transparency. "We hope that the reputation of the Holy See will really gain when Pope Francis continues the work that Pope Benedict has begun: to clean up what needs to be cleaned," Schoenborn said. The first non-European pope in modern times, and Latin America's first, Pope Francis has criticized the Vatican bureaucracy and shows every sign of leading in the simple and austere style represented by the inspiration for his name, St. Francis of Assisi. 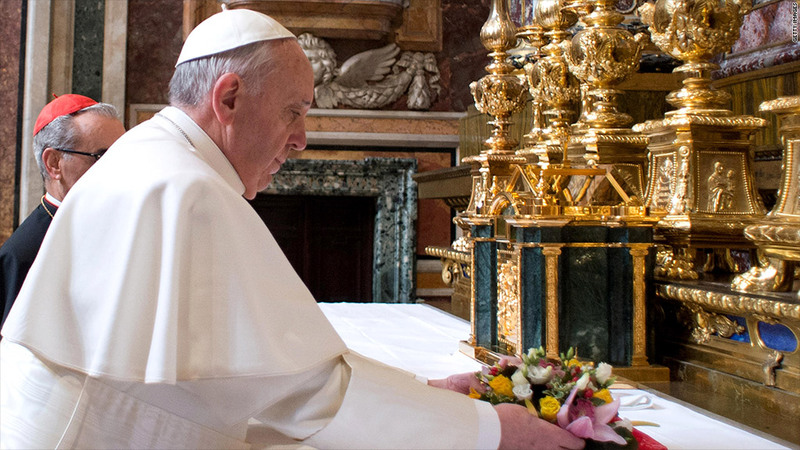 Returning to the Vatican after prayers at the Basilica of Santa Maria Maggiore on Thursday, he insisted on stopping at the residence where he had been staying to pay the bill himself. He also chose to share a bus with other cardinals after his election Wednesday, rather than ride in a car that had been prepared for him. The Vatican has been wracked by internal power struggles over its murky finances for decades. It is trying to shake off a shady reputation that dates back at least 30 years, to the death in London of Roberto Calvi, known as "God's banker". Calvi was found hanging from a bridge and his death has never been fully explained. He was chairman of Banco Ambrosiano, in which the Vatican bank held a small stake. Besides the 500-or-so inhabitants of the world's smallest state, the Vatican bank serves thousands of Catholic charities, religious orders and dioceses around the world. It has some 33,400 accounts and about $8 billion in assets. Experts believe the risk of financial crime at the Vatican to be low. But they're concerned that the bank's global reach, high volume of cash transactions and lack of information about some account holders could make it a target for organized crime. The Moneyval report led to the suspension of card payments at Vatican shops and museums for six weeks earlier this year after the Bank of Italy refused to give Deutsche Bank approval to continue operating systems within the city-state. Payments resumed last month after the Vatican struck a deal with Switzerland's Aduno to provide the service, sidestepping the regulatory authority of the Bank of Italy, which is restricted to EU-based financial institutions.